I’m probably somewhat out of my comfort zone on this one, and researching on the web has not really made me any the wiser. This fab 12″ cover is a generic design, credited to Mark / Rollmann / Macias. It was printed up and used on twelve inch releases produced by http://www.ongaku.de, distributed by Kompakt in Germany circa 2008. Needless to say when I spotted it on the cover in the second-hand rack I couldn’t resist. The only thing which would have made it better would have been to print on matt card instead of that nasty varnish finish. 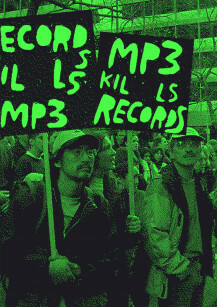 The trio of designers get no hits on search engines beyond a couple of mentions of the cover in various discographies, but the ongaku site does have a couple of small images showing the same art (and similar clever slogans) being carried in the style of street protest banners, so maybe it began life as a performance art project. 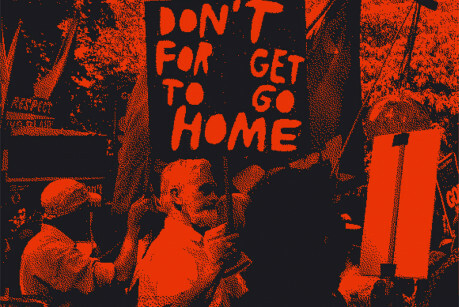 It’s tempting to think the Don’t Forget To Go Home art in one of the shots may also have been designed to dress a 12″ disco cover. I’ve got this 12″ http://tinyurl.com/3gydrqx the cover of which looks like it’s by the same designer as the “vinyl kills mp3s” which I have seen before and probably have in my collection somewhere! The same designer would also seem to work for Smallville Records who are based in Hamburg. You don’t mention what the record is that came in the sleeve featured in this blog; I would be interested in finding out as it could be right up my strasse. Keep It 33rpm. Thanks Vince; yep that’s certainly the same designer. Again it might be a generic bag. The 12″ which came in my MP3 Kills sleeve is Misdirection by bullet:dodge. I’ll give it a spin but might hand it over if it’s not my scene!